A great way for new members with combat below 30 to make good money is to kill chickens and collect their feathers. Once you collect around 500 feathers, you can go to world one and sell them just to the East of the West Bank in Varrock if you’re a Free to Play member. If you’re a Pay to Play member, the best place to sell them is just North of the East Falador Bank. You can usually get about 10-20 gp each in member’s worlds. If you’re looking to buy feathers, head to fishing shops and go for larger quantities. If you buy groups of at least 1,000, you can make a substantial profit. It’s a good idea to sell to people, not stores. Another way to earn money is by merchanting. There are several ways to do this. You can buy overstocked items in one store and then sell them at a higher price in a store where they are not stocked. You can also buy commodities that are being sold at less than market value and then sell them to other players who are willing to pay higher prices. In order to do this, though, it is necessary that you are aware of current market prices. You can buy sharks for around 800 gp and later sell them for around 1000 gp. Similarly, you can buy lobsters for 100 to 130 gp and sell them for 200 gp. Rumor has it that in Edgeville they are desperate for food and selling there can be quite lucrative. 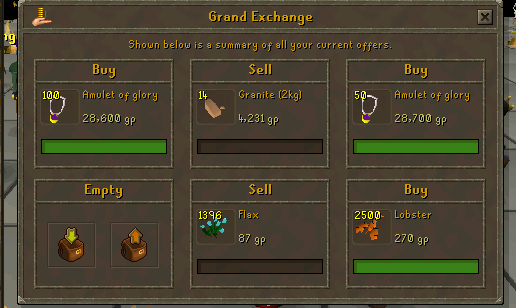 You can buy coal for 130 gp and sell it for around 200 gp near Falador’s east bank. Also consider Rune Essence, which can be bought for 20 gp and sold for 40 at Varrock’s east bank. The higher level you have, the more money you can make in these areas. Mining, fishing and woodcutting are considered the big three moneymakers. However, there are people that find their fortunes in thieving. For example, in mining you can earn 13k for each reunite ore that you mine. For the woodcutter, magic logs are worth 1k each. Fishermen can get up to 1k for each shark and if the thief can get his hands on blood runes, he can get at least 400 gp. Treasure hunting is actually a mini-game for members. There are three different levels, which yield different treasure possibilities. In level one, you can get gold trimmed, black armour worth 300k a set. In the second level, you can get ranger boots worth 700k. In the last level, you can get gold trimmed rune armor, god armor, gilded armor and a Robin Hood hat. Each of these items can be worth over one million gp each. Dueling can win you a fortune, or you can lose everything you have. It’s only worth the risk if you are absolutely certain that you can’t lose.